February 14th is just about here. Do you have special plans for this feast day for Saint Valentine? My husband and I are hoping to spend some time together on Valentine's evening while my older kids help watch our younger kids and other kids at our church for a youth group babysitting night. 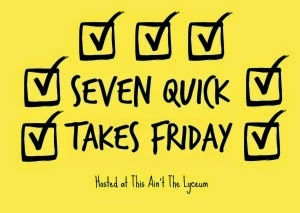 Here are some ways to celebrate this special day in 7 Quick Takes hosted by Kelly at This Ain't The Lyceum. Have you heard about the exciting new Saint site, SaintNook, that I'm a part of as one of the team members? With SaintNook the Saints are always online! 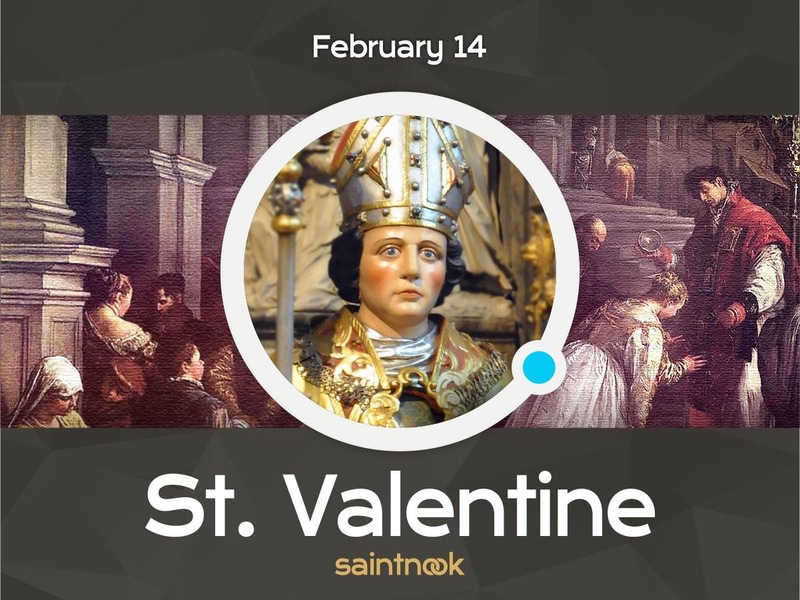 I encourage you to visit SaintNook and check out Saint Valentine's Profile that tells of Saint Valentine's life, his Directory that lists products about Saint Valentine, his Resources that have Videos, Art and Images of this Saint, and Media that has beautiful Scripture images about love. Be sure to follow SaintNook on our Facebook page too! If you scroll down this home page a little and look at my right sidebar >>>>>>>>>>>>>>> you will see a SaintNook button. If you have a blog and would like to spread the word about SaintNook, go to the Link Up page and get a Saint Nook button and find out how you can add your blog link to SaintNook's site! Let's share the Saints and links! SaintNook is a work in progress so visit the website and Facebook page often to keep up with the project and get updates! How about sharing some love for the Saints this Valentine's Day? 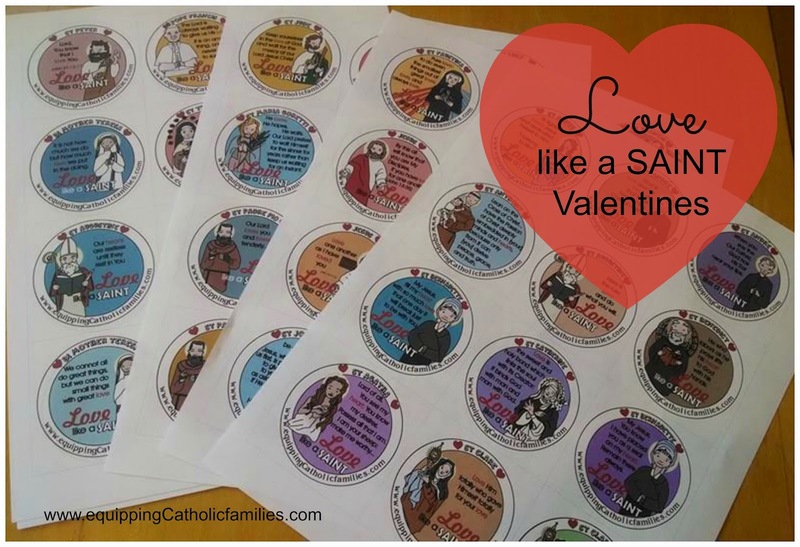 Monica over at Equipping Catholic Families has this awesome craft kit just in time for Valentine's Day this year or for future St. Valentine's Days. This holiday is based on a Saint, so I just love using Catholic valentines to remind my family and others of why we celebrate this day and to spread the faith. I love that each Saint is beautifully drawn by Monica's daughter, Kelly, and each valentine has a quote with the word "love" or "heart" in it from several different Saints. 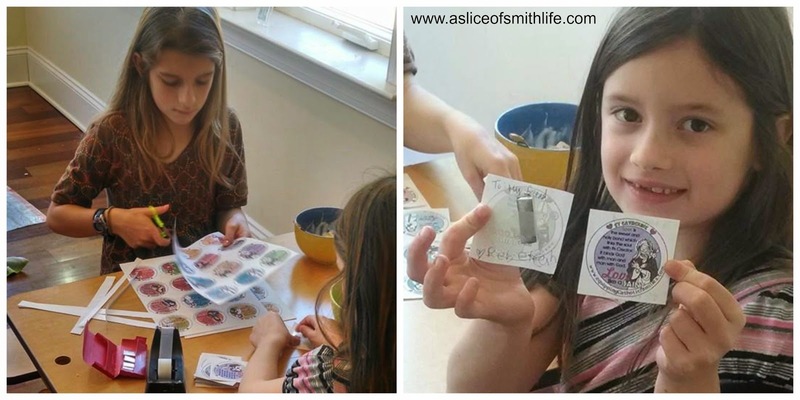 This year each of my children cut out the valentines and signed their name after taping a piece of gum to the back. We are headed to our homeschool's annual Valentine's Day party on Friday with about 30 kids. 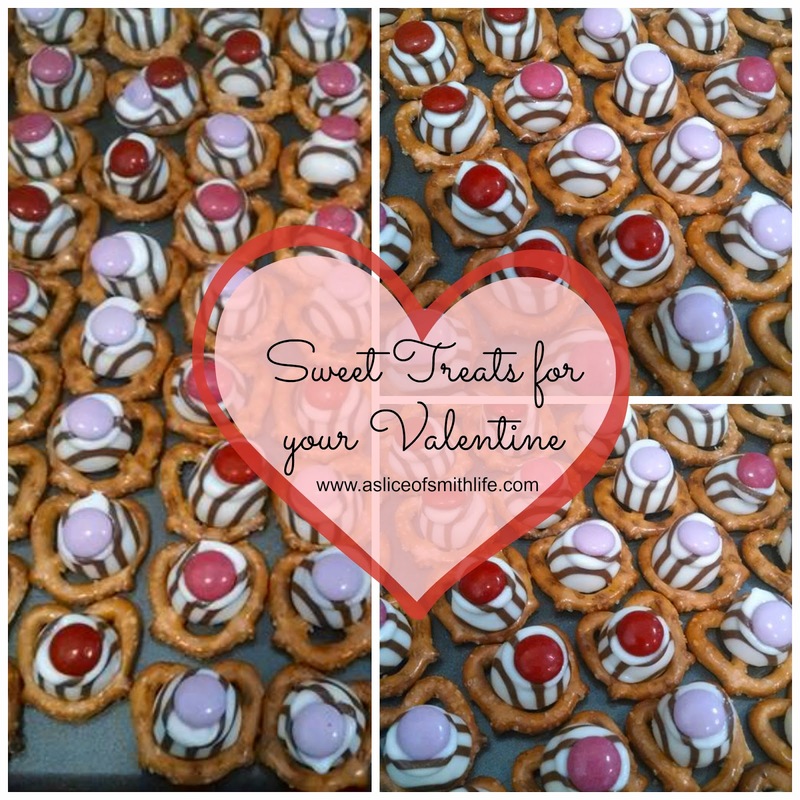 These pretzel treats are so sweet and yummy and so easy to make! My kids and I made a batch of them for our homeschool Valentine's party tomorrow. These are great treats to serve year round too! (Christmas, Valentine's Day, Easter) Change the M & M colors and you have a year round easy treat to make! Go to my post HERE to find out how make them. 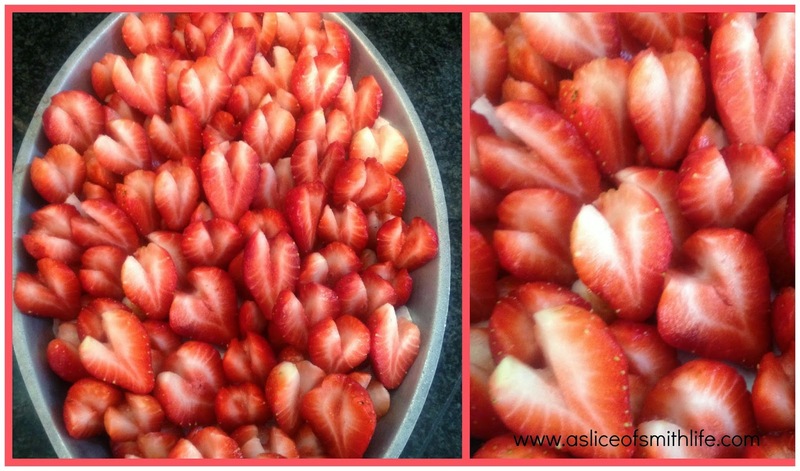 Valentine's Day 2013 I served these sweet and healthy strawberries. Clean, pull stem, cut in half, use paring knife to cut a small "v" at top = berry sweet treat! They were a hit! This is one of our favorite books about Saint Valentine. All the illustrations are mosaic and lovely. While you are eating the sweet and healthy treats mentioned above, you could read this book to your family/friends. 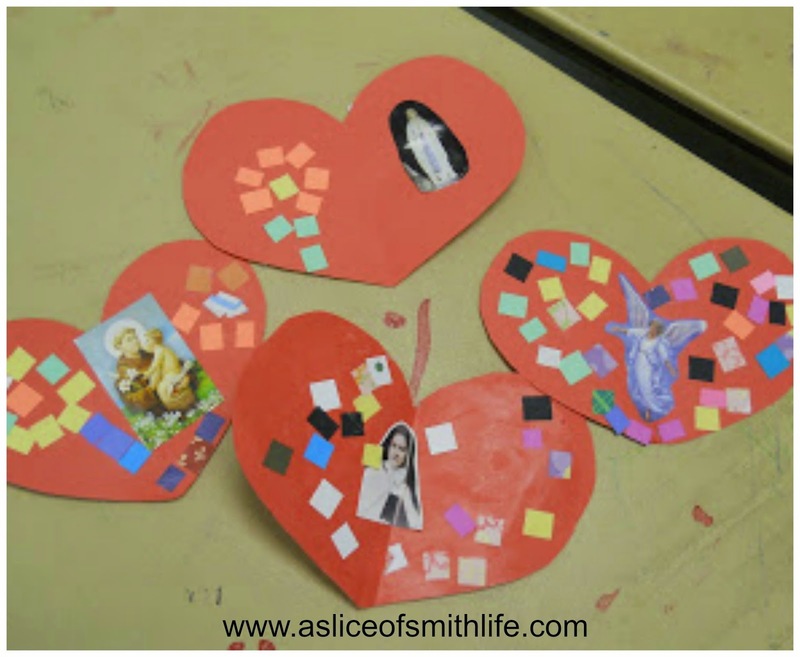 Speaking of mosaic art, on Valentine's Day 2011 our homeschool group made these simple mosaic hearts with holy cards after I read the Saint Valentine book to them. Cut out some read hearts, small squares of paper and holy cards and glue together for a lovely art project. 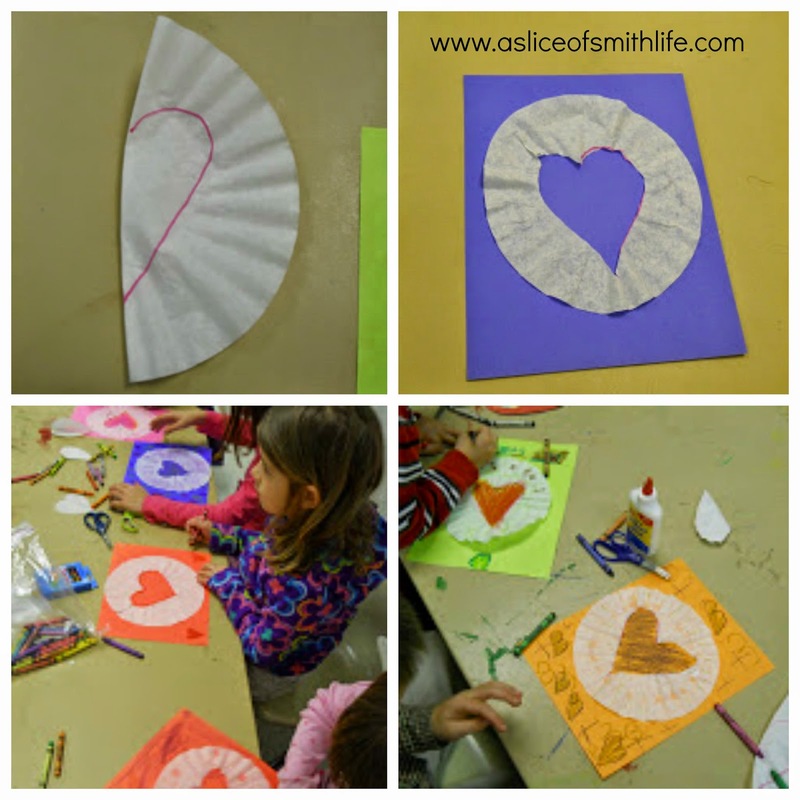 On Valentine's Day 2011 we also made these sweet and simple coffee filter hearts. I folded the filter and drew half the heart on one side and then the kids cut out the filter and glued it to colorful paper. They enjoyed decorating their heart with crayons. 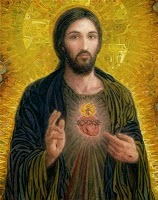 I found this photo titled "Sacred Heart of Jesus" on Photobucket. I've never seen a Sacred Heart image like this before so I thought I would post it here since the greatest Valentine we have ever received is Jesus' sacred heart. For more information on the devotion to Jesus' sacred heart you can read HERE. One of our family's favorite images of the Sacred Heart of Jesus is this painting by Catholic artist Cameron Smith. Have a blessed Saint Valentine's Day and weekend! What a fantastic bunch of ideas!! Between Timmy's play rehearsal and bb game we have a bit of a hectic day tomorrow but will be home and ready to "celebrate" by about 4, which works out well.....simple dinner with lots of heart decor from crafts that the boys made over the years adorning the table and walls. Red velvet cupcakes with white frosting and lots of little heart candies on them and I'm making a few of those pretzel treats to out in heart cupcake holders for each place setting! I'm doing my own take on them bc I never bought the M and M's but I DO have pink/peppermint flavored chocolate melting wafers ( ew what kind of preservatives and dye were put in THOSE to give them that color and flavor?? LOL)with hershey's kisses to put on top of each pretzel. it might be overwhelmingly minty and chocolatey, but should be pretty. We plan to watch a Hitchcock movie or some other classic at night...we're into movie gems on Sat nights. Last week was The Music Man, which I had not seen in decades! Well, I've written a novel here! Sorry to go on and on! Wish we could get together and chat in person! "See" you later. About to get breakfast and school going have a great day, friend!! I love all your fun Valentine's Day activities! I hope you had a blessed weekend! I am listening to Romona's Redeemed by Grace web seminar that you told me about! So beautiful and inspiring! Thank you! God bless and have a blessed Lent! Thank you Angela and what a nice surprise to be selected by Blog Mommas for the week! Have a blessed Lent!